Aveiro is one of those unique cities able to offer a combination of urban sophistication, historical attractions and wide, sandy beaches on which to relax and soak up the sun. The lovely weather throughout the year and the plain, whitewashed streets on the flanks of the lagoon are more than an invitation to visit the region. Thanks to its location, perched on the banks of a lagoon on the west coast of central Portugal, Aveiro has plenty of beaches within easy reach of the city centre, making it a popular choice for travellers who want it all. There is much to do and see within the city centre, but it is well worth coming to Aveiro for more than a day or two in order to enjoy Aveiro’s beaches, which include Sao Jacinto, Costa Nova, Barra and Vagueira. 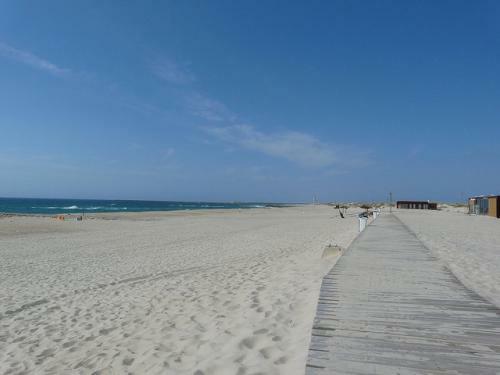 Aveiro’s beaches are accessible by car, bus or by boat via the lagoon and canals. Taking a boat trip that explores the city’s nearby beaches is a great way to see more of the city, as well as providing the most relaxing method of reaching the sandy shores of the Atlantic. However, it is also very easy to hop in the car or take a bus ride the few kilometres that you need to cover. 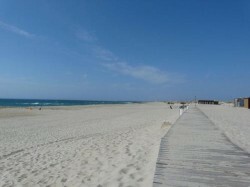 Closest to Aveiro city centre are Costa Nova and Barra beaches. 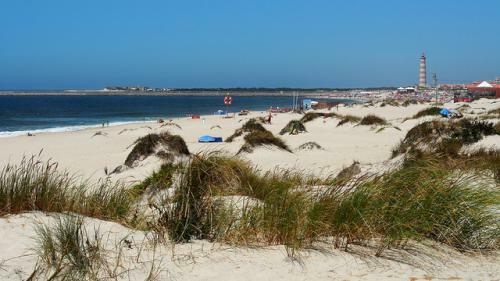 Costa Nova runs the length of the sandy spit that runs in a north-south direction from the outer, southern mouth of the Aveiro lagoon. The western flank borders directly onto the rolling waters of the Atlantic Ocean and is a popular spot for surfers, while the eastern flank faces the calm waters of a spur from the lagoon estuary, making it a favourite choice for kayaking, kite surfing, wind surfing and all manner of other water-based activities. The beach itself is wide and sandy, with grassy dunes to add some interest. 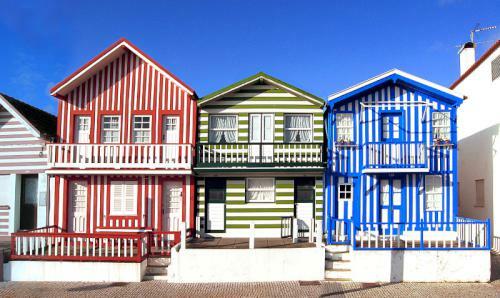 One of the highlights is the ‘palheiros’, the pretty wooden buildings that are painted in candy stripes and lend the Costa Nova beach a unique atmosphere in the area. The houses are mostly used as holiday homes along with some permanent residences and they make for a great photo stop along your way. 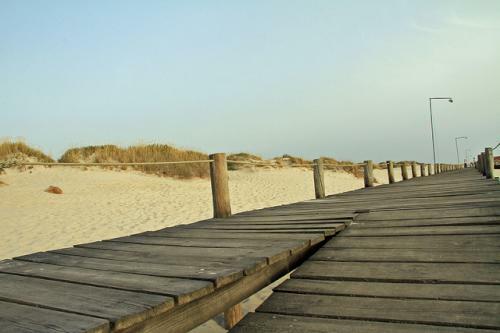 It is possible to walk the length of the beach along wooden boardwalks and floating bridges, which add a feeling of rustic charm. 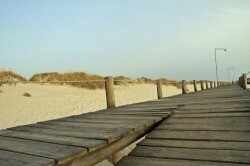 There is a camping site here which is popular in high season, but thanks to the size of the beaches and the abundance of beach choice along the full western flank of Portugal, there are nothing like the crowds that you would expect to find in the southern resorts of the Algarve during the summer. There is an EU blue flag on the estuary beach, with lifeguards on patrol in season. 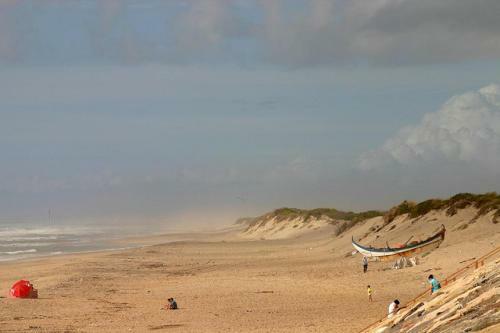 At the far northern tip of Costa Nova beach is Barra beach. 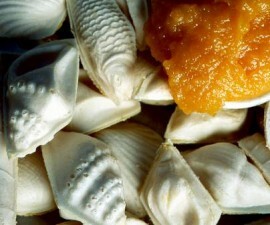 Barra literally means “bar”, referring to the sand bar at the end of which it is perched. Barra beach is perhaps best known for its lighthouse, the Barra Lighthouse or Farol da Barra. With 203 feet (62 metres), it is the tallest in Portugal and the nineteenth tallest in the world. The lighthouse dates back to 1885 (construction completed in 1893) and it was originally accompanied by a fog signal, which was swept away by a storm in 1935 — a stark reminder of why a lighthouse was required here in the first place! Sea walls have since been built for additional protection. It is possible to visit the lighthouse by arrangement, and the site around it is open to the general public throughout the year. 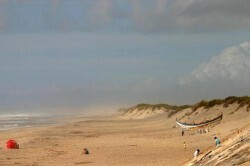 On the north side of the estuary mouth sits Sao Jacinto beach. The area is characterised by its huge, grassy sand dunes, which are an important part of the Sao Jacinto Natural Reserve, so designated for its abundance of flora and fauna. The best way to reach Sao Jacinto beach is by ferry across the estuary, and regular trips run from the city centre. It is also accessible by car but requires a rather roundabout route via Torreira or Ovar. Sao Jacinto beach is perfect for surfing and body boarding and is partially covered by lifeguards during the summer months. However, it is also one of those beaches that are as delightful to explore on the sands as to enjoy frolicking in the cool sea waters. The dunes make the perfect location for a nature trail, discovering the many birds, insects, small animals and plants that grow in this tranquil, protected environment.